This research develops approaches to effectively analyzing and visualizing traffic flow dynamics in large-scale urban networks. In particular, we develop a graph-based analysis framework that converts trajectories of individual travelers into a time-evolving graph of aggregate flows between regions to provide a compact and informative representation of network-wide traffic dynamics. A graph-based representation provides a powerful means of describing complex relationships among entities in a dataset in a simple and intuitive way, and studying the properties of these graphs provides useful information about the internal structure of the dataset. In many real-world systems, relationships between entities evolve over time and such time-varying relationships or connections can be represented as a sequence or time-series of graphs, namely a dynamic graph or time-evolving graph. Traffic flows in a road network can be naturally represented as a dynamic graph, where different parts of the network are represented as graph vertices and traffic flows between them are represented as directed edges with time-varying weights. By transforming individual trajectory data into dynamic graphs of aggregated flows, we construct different types of flow graphs, called Trajectory Flow Maps, that capture different aspects of traffic dynamics (e.g., traffic demand, congestion propagation, connectivity/reachability) with varying levels of spatial and temporal aggregation. Leveraging large amounts of movement data that are increasingly being collected around the city, this research aims to contribute in exploring new ways of understanding, visualizing, and predicting city-wide traffic dynamics and mobility patterns. Yildirimoglu, M., Kim, J., 2017. 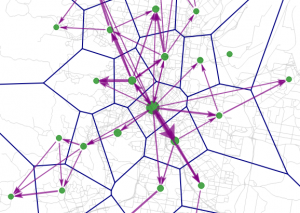 Identification of Communities in Urban Mobility Networks using Multi-layer Graphs of Network Traffic. Transportation Research Part C: Emerging Technologies, Vol. 89, 254-267. Kim, J., Zheng, K., Corcoran, J., Ahn, S., Papamanolis, M., 2017. Trajectory Flow Map: Graph-based Approach to Analysing Temporal Evolution of Aggregated Traffic Flows in Large-scale Urban Networks. Proceedings of the 96th Annual Meeting of the Transportation Research Board. Washington, D.C., USA. Kim, J., Zheng, K., Ahn, S., Papamanolis, M., and Chao, P., 2016. Graph-based Analysis of City-wide Traffic Dynamics using Time-evolving Graphs of Trajectory Data. Proceedings of Australasian Transport Research Forum 2016, 16 – 18 November 2016, Melbourne, Australia.